William Archer took up the land opposite his brother at Woolmers and started to develop a new and innovative farming enterprise. Brickendon has remained the same 1150 acres or 465 hectares as originally granted in 1824. Unlike his brother, William wished to develop Brickendon into a mixed farming enterprise with cropping being a major focus. The land was therefore cleared of its native bush being blackwoods and wattles and then divided into approximately 30 acre paddocks. The early form of fencing was a combination of post and rail and hawthorn hedgerows of which Brickendon still has around 30 kilometres. Driving through the farm nowdays is quite reminiscant of an english farm, in fact the landscape has not altered since the early 1830's. Wheat (corn), Barley, Linseed and Flax were all grown in the flats where the many draught horses and bullocks tilled the soil or harvested the crops. Convicts spent many days hand digging drains through the farm to improve the soil and many of these can still be seen today. With a large work force of animals requiring feeding, fodder crops including Mangolds, Wurzels and Turnips were also cultivated then stored and processed with equipment that is still located in the barns and granaries. 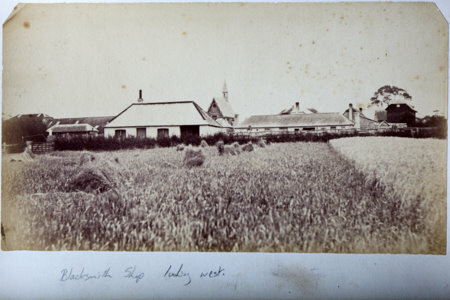 By the 1840's Brickendon was highly regarded as one of the best farms in the colony as quoted in Paul Strezlicki's book Physical description of New South Wales and Van Diemen's Land. The biggest change to Brickendon occured during the early 1900's when the farm became more meat producing with the introduction of Shorthorn cattle and Corriedale Sheep. Other changes were also to come with the purchasing of modern farming equipment. Tractors replaced horses and bullocks and steam engines powered mighty threshers thus reducing the manpower requirements. From a workforce in the 1800's of between 45 and 50 men - todays farm is operated solely by Richard Archer (6th generation). Irrigation has been the most recent innovation with three centre pivots watering approximately 200 hectares of the farm. This has allowed for a more intensive cropping programme with today's crops including vegetables, poppies and specialist seed and grass crops. The farm also runs livestock with around 80 angus cows and 1500 sheep being a combination of corriedale x coopworth and romney x merino with terminal sires being either Hampshire or South Suffolks. The ewes are pre-lamb shorn in June in what is believed to be the oldest continually operating commercial shearing shed in Australia. Brickendon's farming future is looking positive and will in time be in the hands of the 7th generation - William who is currently studying at Marcus Oldham Agricultural College.